Show Your Stitch & Print T-Shirt: Win a Bottle of Champagne! Hen Night? Stag Night? Holiday? If we’ve supplied the T-Shirt for your big 2014 event all you need to do for a chance to WIN A BOTTLE OF CHAMPAGNE (or a crate of beer for the boys!) is post a picture of your group in their T-shirts & tag Stitch & Print in your Social Media post – We’ll repost it (modesty allowing!) & you’ll be in the draw! That’s right, We’re wanting to give away Champagne or beer in return for a photo of your group trip wearing the T-shirt Stitch & Print provided for you. All you need to do is tag Stitch & Print into a post with a photo of your gang’s T-shirt on your preferred social media channel & we’ll put your name in the hat. Have a great trip & see if you’re lucky enough to win a prize! This entry was posted in Promotional, T Shirt on 7th May 2014 by admin. Bling Bling! 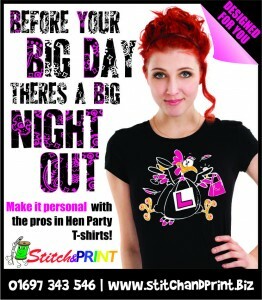 Just add Diamantes …..
Hen party T shirt to bring added sparkle to Carlisle nightlife! As well as embroidery & print we also supply garments with diamante designs; Ideal for hen parties, anniversaries & birthdays diamante encrusted garments are fast becoming one of the most popular ways of glamming up your look. Stitch & Print can make you sparkle by personalising t-shirts and various other fashion items with diamantes, If you would like to find out more, or get a quotation, you can either email office@stitchandprint.co.uk or telephone 016973 43546 with the quantity and type of garment you would like us to create. Either your design is carefully created using diamante stones, which are then heat-sealed to the garment. The diamantes are even available in a variety of colours. Encrusting garments with diamantes really adds a bit of sophistication and bling to your wardrobe! But it isn’t always cheap to create your personalised look; A mould has to be created for each design so kitting out all the chicks for your hen party can be expensive! Thankfully for the more popular designs we have a range of stock alternatives that are economical. Alternatives and Additions to Diamante Bling for the Next Party Trip! Glitterflex and Holographic foils another alternative to diamante for added sparkle on Cumbrian nights out! We use holographic foil, which is a type of transfer vinyl to replicate diamantes; It’s cut into stone shape & sized pieces & applied to the garment & the reflective nature gives a similar look to diamantes. Glitterflex is a type of transfer vinyl that adds a lot of sparkle to your design however it doesn’t give the bright “catch the light” reflection that you get with stones or holographic foil. Both of these decoration types add a real wow factor to your outfit and one-offs can be produced at a fraction of the cost of using diamantes, something well worth considering if you’re catering for individual designs for all the girls! Be it diamantes, foil or glitterflex we’ve got the means to really give your party outfit the edge over the competition! This entry was posted in Garment Decoration, T Shirt and tagged Cumbria, decoration, diamante, hen party, leisure, North West, party on 17th April 2014 by admin. T-Shirt Printing – Everyone Wants It, We Do More Than Most! A simple t-shirt provides a brilliant canvas to print your creative message on! 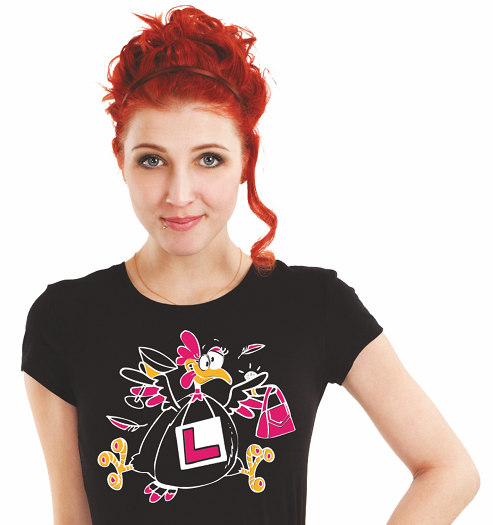 T-shirt printing gives one of the most popular and versatile garments in the world a whole new lease of life. With Cumbria based Stitch & Print’s expert embroidery and print services the t-shirt is even more versatile. We have a huge range of colours, styles & fabrics available which you can see in our web brochure. The T-shirt evolved from undergarments used in the 19th century and became very popular with the US Navy, due to it’s lightweight and comfortable fit. Over time it became more and more popular as a bottom layer with workmen in various industries such as agriculture. 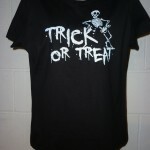 Halloween T-Shirt designs printed on a spooky black base are always popular with the kids. One of the more recent developments, t-shirt printing, has seen legions of wearers using them as a medium for self-expression and advertising. Stitch & Print can help you become part of this trend with our expertise in garment printing and embroidery. Stitch & Print can help to make your workforce look smart by adding your company branding, logo and staff names to one of our range of work-friendly t-shirts. Russell Workwear are skilled in providing functional and practical work apparel, including 100% cotton t-shirts with double layer shoulder panels for added durability. These shirts are available in a range of colours to suit your company. T Shirt printing or embroidery can be applied in a number of areas giving your brand an added degree of self expression. We can also custom print high-visibility t-shirts in four ultra-bright colours, particularly useful for walkers, cyclists and people working in low light or hazardous environments. A T Shirt Style For Everyone – Before We Print It! Stylish and fashionable t-shirts aren’t exclusive to the high street shops, and Stitch & Print have a range of t-shirt styles in stock that is second to none. 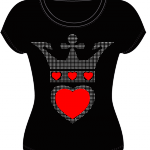 You can choose from B&C, Fruit of the Loom and Gildan V-neck t-shirts in black white and many colours in-between. For a really ‘on trend’ look you could opt for the Bella Canvas Deep V-neck, which is a very popular choice for young men. Skinnifitmen offer a long sleeved t-shirt manufactured with a blend of cotton and elastane, to give it a slim and modern fit. We have baseball style t-shirts by Kariban, which are available in over ten contrasting sleeve and torso colour combinations. Most of the t-shirts in our catalogue are available in the usual wide range of sizes, from XS to XXL. Those looking for a particular colour will be pleased to know that the Gildan Ultra Cotton t-shirt is available in over 60 colours, including ANSI/ISEA certified safety colours. We can customise whichever colour you choose, from serene green to cherry red! Stitch & Print can also print and embroider a variety of female fitting t-shirts, including the Okarma 100% GOTS and Control Union certified cotton t-shirt for a soft and comfortable feel. More unconventional women’s styles are also available, such as the Longine and Flowy t-shirts perfect to wear with leggings, provided by Skinnifit and Bella Canvas. Expert T-Shirt Customisation From Cumbria’s Favourite! This entry was posted in Garment Decoration, Product updates, T Shirt and tagged borders, Carlisle, Cumbria, leisure, North West, printed, T shirt, workwear on 15th May 2013 by admin.